The Medlar Angling Classics are a very cost-effective way to read great anglers and for all that it is no. 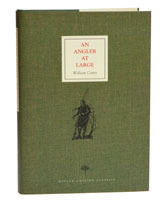 7 in the series, Caine’s An Angler at Large wouldn’t be a bad place to start by any means, because Caine was a great humourist - his chapter ‘Of Graylings, Large and Small’ is probably the funniest piece of angling prose ever printed. The book is nearly a century old, the first printing being back in 1911, but Caine was an amazingly modern writer and he gets under your skin to an extent that makes the book hard to put down after only a few pages. He trained as a barrister, but his talents were wasted on the law and he soon took up an alternative career as a journalist and author, making his name as a magazine writer for The Field and Punch among many others. An Angler at Large is by turns observant, satirical and howling funny, the subject matter ranging from chub and flounders to a parody of Walton that still leaves me helpless with laughter every time I read it. Very few books come near this one and it would be up there in many anglers’ top tens, so I can hardly recommend it more.